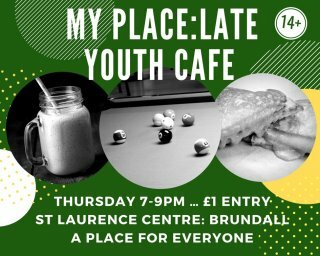 My Place Youth Cafe is a cafe style group for young people in year 6 to year 11. There s £1 entry cost which includes food and drink. 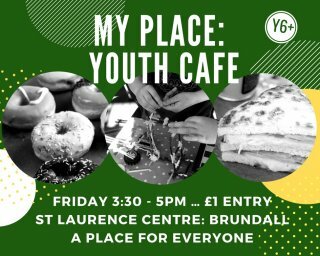 Everyone welcome to this All Age mix of food, activities and interactive Worship. meets on the 1st Tuesday of the month at 2.30pm. 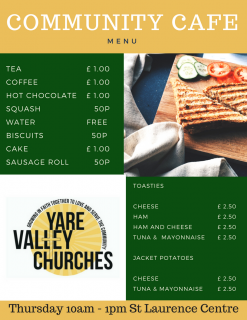 Yare Valley Churches want to ensure that everybody has the opportunity to join one of our GIFT groups. 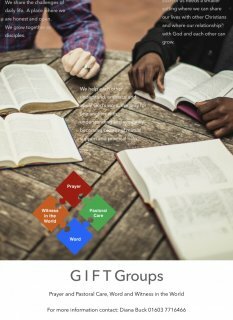 We are ordinary people who meet together in group; to Pray together, to offer Pastoral care and support each other, to explore God's Word together and to bear Witness in the World by striving to apply what we learn to our daily lives. It can be a difficult, lonely and daunting journey on your own, but GIFT groups offer us the chance to meet with others who are travelling the same spiritual road and to walk with them. Group members are often at different stages of this journey, but together we learn from each other, and support and encourage each other along the way. 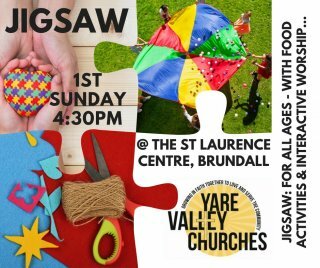 We have several GIFT groups which meet at different times, daytime and evening, on different days and with different frequency - either weekly or fortnightly.